Using a credit card reader for iPhone and iPad lets businesses accept credit cards anywhere they operate. 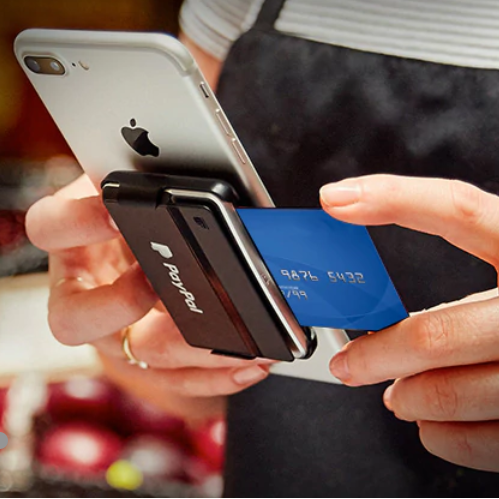 Card readers connect to an iPhone via Bluetooth or wired plug, and then process card payments via a mobile point-of-sale (POS) app. We compare top card readers for iPhones and iPads based on processing features, processing options and costs. In evaluating mobile payment processors, we found that most deliver a similar set of basic features. Nearly all offer credit card readers for iPhone and iPad that process magstripe, Europay, MasterCard and Visa (EMV) chip cards and contactless eWallet payments. All provide a free mobile point-of-sale (mPOS) app to process credit card payments and track sales. Most providers offer a workable mix of these criteria. However, one service checks every box and that’s Square. 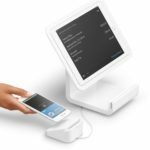 Square gives users a free account, free magstripe credit card reader for iPhone and iPad and a free mPOS app that delivers far more processing, sales and business management features than the competition. Square is our pick for the best overall credit card reader for iPhone and iPad for all types of sellers, from individuals and mobile businesses to multistore and multichannel operations. Square delivers the best overall value compared to the others on our list because it lets you sell anywhere and powers it all with a free suite of multichannel business management tools. The free Square mPOS app tracks your sales, inventory details and employees wherever you sell, plus lets you key-in transactions, work in offline mode, bill clients via online invoices and much more. For all of this functionality, your only cost is credit card processing fees, which run 2.75 percent of each credit card sale you make using your Square card reader. Square’s fees are very competitive with our other contenders and clearly beat those that have monthly fees like Shopify POS, QuickBooks and Cayan. Overall, most card reader services simply don’t equal Square’s level of sales and management features and fees-only price point. Square’s free magstripe credit card reader for iPhone and iPad (left) is compatible with iOS 9.0 and later, standard jacks and Lightning ports (using the $15 adapter). Contactless readers (center and right) are $49 and connect via Bluetooth. 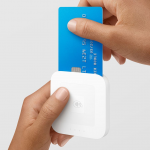 Square charges a competitive flat-rate 2.75 percent credit card processing fee each time you accept a credit card with your card reader. This rate is very competitive with other combined card reader and payment processing services on our list. With Square, that’s your only cost, Unlike those with monthly fees like Shopify POS and QuickBooks Online. Square has no startup, account or cancellation fees, and you even get a free magstripe card reader upon signup. Plus its more advanced Bluetooth contactless EMV chip card and eWallet reader is only $49, making it the best contactless card reader value on our list as well. However, the best part about Square is its robust mPOS sales app, which is also free and delivers more business management features than the others on our list. Combined, its $0 account fees, low processing fees, free and best-value card readers and exceptional mobile app software makes Square our top pick for a credit card reader for iPhone and iPad. 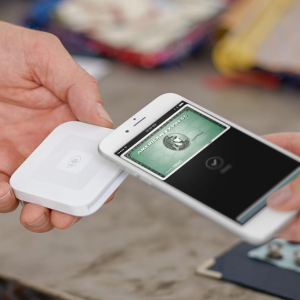 Square boasts several features that place it above other competitors, such as compatibility with a variety of older and newer iPhones and iPads, offline processing mode and exceptional mPOS business management tools top the list as you’ll see below. Square typically deposits your revenues, minus its processing fee, the following business day. You can get same-day deposits, but for an added 1 percent fee. PayPal Here is the only mobile credit card processing service on our list that offers same-day deposits with no added fees. Square operates in offline mode, unlike most others on our list. Even if you lose your cell or Wi-Fi connection, you can complete credit card sales. Square’s mPOS app retains the encrypted card data until your connection is reestablished, then processes the payment as usual. Offline mode is a big plus if you sell in remote locations or within facilities that have limited connectivity. However, it’s important to note that in offline mode you won’t know if a credit card payment is declined. If the charge is declined when the connection is reestablished, you’ll need to follow up with your customer for an alternate payment method. This list just scratches the surface of all that Square’s robust mPOS app delivers. To see all of the ways that Square helps you run a business, visit our complete guide to Square’s services. These ready integrations are another reason that Square tops the other providers on our list. Even if you just need a credit card reader for iPhone or iPad now, it’s a good idea to be forward-thinking. 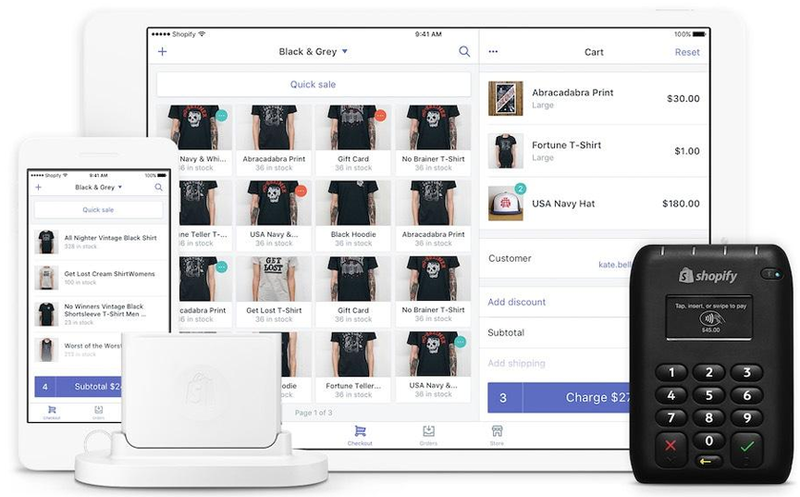 Using Square, you also get a complete, well-connected sales management system that’s designed to grow in whatever direction your business takes you. Square checks all of the key boxes in terms of credit card readers for iPhone and iPad with simple, straightforward payment processing. However, Square is an all-in-one solution, which means you can’t use a Square credit card reader with your own merchant account. In contrast, if you get your card reader through a traditional merchant account like Cayan, which we cover below, you can price-shop for plans with lower processing fees. However, in our comparisons, Square’s processing fees tend to be lower than a traditional merchant account if you process less than $10,000 per month. Add in the feature-filled mPOS app, and Square easily tops a traditional merchant account for most small sellers. In user reviews, most Square users are happy with Square’s credit card readers for iPhone and iPad, its ease of use and the vast range of services that the Square mPOS app provides. Negative comments tend to center on Square’s lack of phone service and withholding of funds. Square is reportedly improving its phone service, so that issue is being dealt with. Users need a code to contact Square, but that’s found within your account dashboard easily. Per funds withholding, that’s tied to the seller’s business model and chargeback rate. So, while inconvenient for the sellers who have to deal with it, it’s not widespread. 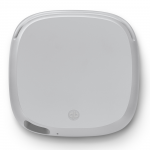 With Square’s go-anywhere card readers, you can accept credit card payments wherever you sell. Its free, full-featured POS app and business management tools let you grow in whatever direction your business takes you. Sign up for a free Square account today, get your free reader and discover all that it offers. 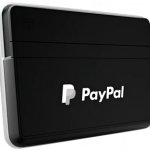 If your business currently accepts PayPal payments and needs a credit card reader for iPhone and iPad to accept in-person payments, PayPal Here is an ideal option. PayPal Here is a free add-on to any existing PayPal account, and you can choose from a variety of card readers to suit your mobile payment needs. The PayPal Here mobile app also lets customers pay using their PayPal account onscreen, which is a nice sales perk that the others on our list can’t match. 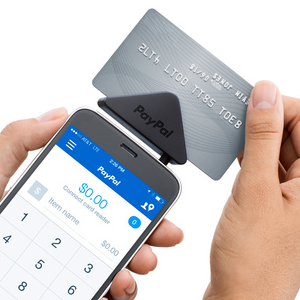 PayPal Here has several card reader options to choose from, including magstripe, chip and contactless credit card readers for iPhone and iPad. Like Square and most other providers on our list, PayPal Here offers low flat-rate processing fees with no startup, monthly or cancellation fees, so credit card processing is your only ongoing cost. PayPal Here’s processing fee is slightly lower too. It’s just 2.7 percent, compared to Square’s 2.75 percent fee. However, PayPal Here doesn’t provide a free card reader, so you have an upfront cost there. Businesses that process less than $500 per week in credit card sales. Like our other top picks, PayPal Here provides a free mPOS app to process and track sales, plus it conveniently ties your in-person and online sales within one account. Its solution isn’t as feature-filled as Square’s mPOS app, though. It doesn’t have an offline mode, and functions like keyed-in payments are limited. It does, however, provide same-day deposits, which is a nice perk. PayPal Here tops the others on our list by providing same-day deposits of funds into your PayPal account. This is a nice perk that Square can match, but only with an added 1 percent fee. There is a caveat. If you use the PayPal Here magstripe reader, you’re limited to transactions totaling $500 within a seven-day period. If you process more than $500 per week using the magstripe reader, your funds are subject to a 30-day hold. 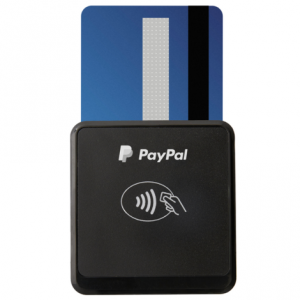 That’s why PayPal Here recommends the more secure chip or contactless readers for most sellers. This limit also applies to keyed-in payments, which PayPal Here discourages. 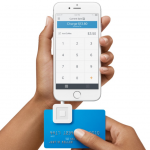 Square is much more amenable to keyed-in payments. Unlike Square, PayPal Here has no offline mode. Without a connection, you cannot accept credit cards, period. However, you can still record cash and check sales in your PayPal Here mPOS app. PayPal is a leader in online integrations and works with virtually every ecommerce platform on the market. It also connects to eBay, other online marketplaces and various bookkeeping programs. 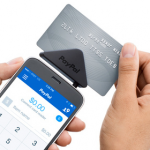 So, sales made using a PayPal Here credit card reader for iPhone and iPad tie neatly into your other PayPal revenues and can be tracked in your accounting software. Lack of an offline mode is a real drawback for mobile sellers. If you’re selling in an area with spotty connectivity, you can’t accept credit cards with PayPal Here, unlike Square and Cayan, which accept credit cards offline. Pair that with limited mPOS features, such as no inventory counts or customer tracking, and PayPal Here falls short in terms of key features that many businesses need. The $500 per week sales limit on the magstripe reader is inconvenient but remedied easily by purchasing a chip card or contactless reader. In user reviews, PayPal Here’s $500 weekly limit on magstripe card sales is a major complaint. Its practice of holding funds when this limit is exceeded takes users by surprise. However, after reading this article, you know that fact going in. Use the chip card or contactless reader to avoid this issue. Overall, PayPal Here is most lauded by sellers who use PayPal online and wish to accept in-person payments too. PayPal Here is the ideal card reader choice for any PayPal user that wants expand into in-person sales. It offers several low-cost credit card readers for iPhone and iPad, low flat-rate credit card processing fees and your payments appear in your PayPal account the same day. 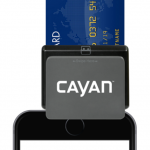 Cayan pairs a credit card reader for iPhone and iPad with its traditional merchant services account. This means Cayan’s credit card processing rates are based on your industry and overall volume, unlike the flat-rate services on our list. In our comparison of credit card processing fees, Cayan’s competitive interchange-plus are lower than a flat-fee provider when sales reach $10,000 or more per month. Of course, many factors contribute to the rates you pay, so it’s best to contact Cayan to see what it can do for your business. Cayan gives account holders one free credit card reader for iPhone and iPad use. It processes both magstripe and EMV chip cards but not contactless eWallet payments. Cayan provides a credit card reader for iPhone and iPad for free, and your processing fees are based on your industry, sales volume and other factors. For most small businesses, Cayan’s interchange-plus fee plan offers savings as sales grow. Here’s a look at the account costs and estimated processing fees. As shown above, at $10,000 per month, Cayan’s fee beats Square. However, Cayan’s mPOS system is very basic. To enjoy all of the business management services that Square offers, you’d need to add other business management tools like a POS system, which can add costs. Cayan’s mobile credit card reader solution isn’t as streamlined as the others on our list. Unlike the all-in-one services, Cayan’s service offers basic processing and not much more. 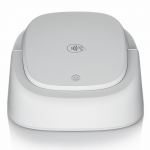 The mPOS is very simple, and while it completes and tracks sales, it’s not a total business management system. Cayan’s documentation does not list specific iOS and device compatibility. However, Cayan’s card reader has been available for some time, so it and the included mPOS works with a range of iPhones, iPads and other Apple devices. You can learn specifics by contacting Cayan. Cayan typically deposits funds within two to four business days. Visa and MasterCard payments tend to deposit in about two days, American Express card payments within three to four days. This is typical of most traditional merchant account services. 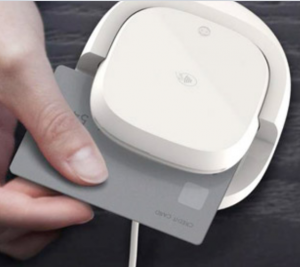 Like Square, Cayan’s mPOS system also works in offline mode, so you can accept credit cards without a connection, then complete the charges when the device reconnects. Also like Square, if an offline payment is later declined, you need to contact your customer to remedy the issue. For features like detailed inventory tracking and customer management, you’ll need to add a full-featured POS system like Lightspeed POS to your Cayan setup. Unlike Square, this capability adds costs. However, if you sell in volume, are growing fast and want the lowest possible credit card rates, Cayan is worth a look. As a traditional merchant services provider, Cayan can connect to an array of ecommerce platforms, accounting tools and retail POS systems. Some of these connections are plug-and-play while others require some technical expertise. Most sellers already use Cayan for their retail store or online payment processing. The mobile reader is simply an extended feature. But, you can certainly start out with the Cayan reader and add needed retail POS systems or ecommerce platforms as you grow. Cayan’s credit card reader for iPhone and iPad only reads chip and magstripe credit cards. You have to move into other Cayan-enabled devices to accept contactless payments like Apple Pay and Android Pay. Cayan’s mPOS isn’t the equal of Square, either. It handles, tracks, and reports on basic sales details, but that’s about it. In user reviews, Cayan’s fees tend to be the top complaint, but that’s typical of any traditional merchant account service. It’s important to take the time to understand how credit card fees work to avoid surprises with a traditional merchant account. Other users note issues with customer service. However, Cayan does have a published phone number, and the representatives we spoke to were knowledgeable and responsive. Cayan is best for the fast-growing volume seller that wants to use a credit card reader for iPhone or iPad and get the lowest possible rates. If this is you, contact Cayan to see how it can help your business grow. GoPayments is the credit card reader for iPhone and iPad that works within QuickBooks. If you’re a QuickBooks user, GoPayments is the easiest way to process mobile credit cards and track sales within QuickBooks. GoPayments offers two credit card readers and a few different payment processing plans and everything integrates with both QuickBooks online and desktop. 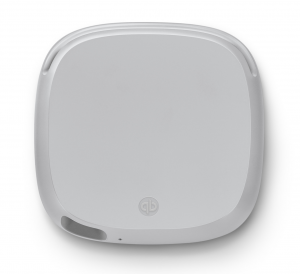 QuickBooks GoPayments credit card readers for iPhone and iPad process magstripe and chip cards as well as contactless payments. Like others on our list, GoPayments provides a free magstripe and chip card reader when you open an account and card processing fees are your only ongoing cost. At 2.4 percent for in-person payments, GoPayments rate is lower than other flat-rate providers on our list. But, you must also include the per-transaction fee of 25 cents, which the other flat-rate services don’t charge when comparing overall costs. Businesses that regularly accept magstripe and EMV chip credit and debit cards. The most important feature of GoPayments is its integration to QuickBooks. You process payments using an mPOS app on your iPhone or iPad like others on our list. The GoPayments mobile app features a suite of payment processing and sales tracking tools, and it all syncs with your QuickBooks Online or Desktop data. Like Cayan, QuickBooks Payments is a traditional merchant account and funds are typically deposited within two to four business days. So, with GoPayments, Visa and MasterCard funds are deposited within two to three days and American Express payments within three to four days. Unlike Square and Cayan, QuickBooks GoPayments does not have an offline mode to process credit cards without a connection. You can record check and cash payments when offline, but not credit card payments. The main integration for GoPayments is QuickBooks, and QuickBooks itself has a huge index of integrated ecommerce, order management and retail POS system solutions. Customers created in GoPayments aren’t automatically created in QuickBooks — you have to add them manually. In reviews, users seem unhappy with the lack of item, inventory and customer sync between the GoPayments mPOS app and their QuickBooks file. But, it does offer the most integrated credit card processing service for QuickBooks users and most appreciate that. Its simple flat-rate fees are competitive and users also report getting lower processing fees through QuickBooks Payments as sales volumes increase. If you’re a QuickBooks user that wants to accept payments using a credit card reader for iPhone or iPad, GoPayments is the solution to check out first. No-surprise processing rates and clean transaction sync with QuickBooks make GoPayments the ideal solution for QuickBooks users looking to add mobile sales to the lineup. If online sales are your main focus but you still want an in-person option, Shopify’s online store and mobile POS solution are about as turnkey as it gets. Shopify is a simple yet full-featured ecommerce platform for launching, managing and marketing an online store. With your Shopify account, you also get a free credit card reader for iPhone and iPad that lets you sell beyond the online borders of your Shopify store. 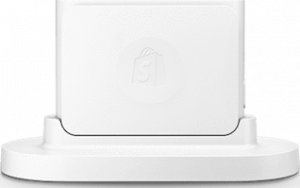 Shopify POS offers two credit card readers for iPhone and iPad: a magstripe and chip card reader (white) and magstripe, chip and contactless reader (black). Unlike others on our list, Shopify has a monthly fee. This is because you need a Shopify ecommerce store account to access the Shopify POS card reader feature. But, adding the mPOS feature to any Shopify store account is free, plus you get a free magstripe and chip card reader. If you just need a credit card reader for iPhone mobile sales, the no-monthly-fee options like Square or PayPal Here are more economical. But, for pairing an online store with in-person sales, Shopify is a good value. Like the others on our list, you also pay flat-rate credit card processing fees and that rate is based on your Shopify plan. Shopify is a full-featured ecommerce platform, and many of its powerful online selling features, such as sales tracking, customer data, items and inventory counts all sync to the mPOS app. So, if you plan to sell online and in-person via mobile device Shopify’s solution is very streamlined. It also gives you a simple entry into multichannel sales. Even the $9 Shopify Lite plan gives you a way to list products on a blog and in a Facebook shop and the higher plans integrate with Amazon, Pinterest and other sales channels. Both Shopify POS credit card readers for iPhone and iPad work with Apple devices running iOS 9.0 and higher — specifically iPhone 5 and iPad 3 and higher, according to Shopify’s card reader specifications. Shopify POS typically deposits your revenues, less its processing fee, within one to three business days. Unlike Square and Cayan, Shopify POS doesn’t have an offline mode to process credit cards without a connection. You can record check and cash payments in the Shopify mPOS when offline, but not credit card payments. Shopify POS is the only service on our list that truly competes with Square in terms of sales and business management features. Shopify’s powerful ecommerce platform drives the mPOS app, so sellers can access every multichannel sales and marketing feature that Shopify offers. Plus, like Square, key data cleanly syncs between the mPOS app and Shopify online store dashboard. Like Square, Shopify POS is part of a full-featured sales platform. To learn how Shopify can help you grow an online business and support in-person sales needs, visit our guide to Shopify pricing and features. Shopify integrates with a vast array of business, marketing, shipping, supplier and sales management tools. In short, you can connect Shopify to virtually any system you choose, from QuickBooks and print-on-demand vendors to drop-ship suppliers and a WordPress blog. See the complete list of Shopify integrations in the App Store. In user reviews, Shopify POS hits a home run. Users love Shopify’s powerful online sales platforms and that love extends to Shopify’s mPOS app and credit card readers. Ease of use, sync with Shopify’s back-end tools and competitive rates are boxes that Shopify POS clearly checks. Monthly account fees and limited scalability are issues that users mention as negatives but, overall, Shopify POS delivers on expectations. You need a Shopify online store account to access Shopify POS. You can start with the $9 per month Shopify Lite account, get your free credit card reader for iPhone and iPad and access several Shopify online sales tools on a budget. Alternatively, you can dive right into a Shopify online store plan, which starts at $29 per month and launch a complete online store in minutes. You can get a credit card reader for iPhone and iPad from many different payment processing services. The right one for you depends on your overall sales needs. Square is a simple and economical choice for most independent sellers and small businesses plus it gives you plenty of tools to grow in any direction. If you already use PayPal for online payments, are a QuickBooks user or need Shopify’s powerful online platform, you can use those card reader solutions for in-person payments. However, if volume sales are your goal, a traditional merchant account like Cayan can help you save on process fees. The takeaway here is that there are many ways to get a credit card reader for iPhone and iPad to handle mobile sales. Which solution do you think is right for you and why? We’d love to get your input in the comments below.